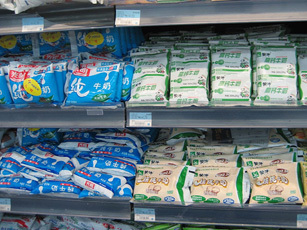 Shelves of milk at a Walmart in Beijing. Four children have died and at least 6,000 have been sickened by milk powder in China. Authorities have arrested 12 people in connection with the contamination of baby milk powders with industrial chemicals. The scandal has raised questions about China’s ability to regulate the safety of its food products. Last week’s inspection of dairy farms found that 13 percent had produced the tainted formula. The “Danwei” blog summarizes a local Chinese-language article, which reports that the local government accepts blame. Global Voices Online provides three posts on the milk crisis: Chinese food edibility, the fury over poisonous powdered milk and the “Made in China” label. Blogger “Imagethief” suggests the government concealed the scandal as to not to tarnish its image during the Olympics. Blogger Robert Vance blames corruption and lack of ethics in Chinese business, stating that only the international community can help improve China’s oversight. Last year, thousands of American pets were sickened by eating Chinese pet food contaminated with melamine — the same toxic chemical in the milk. Photo courtesy of Flickr user jdrewschke under a Creative Commons license.